Of course, those paying attention to the data already knew this. Our politicians and central planers have been peddling to us the fantasy that the global economy is strengthening, finally ready to fire on all cylinders after nearly ten years of dependence on monetary stimulus. 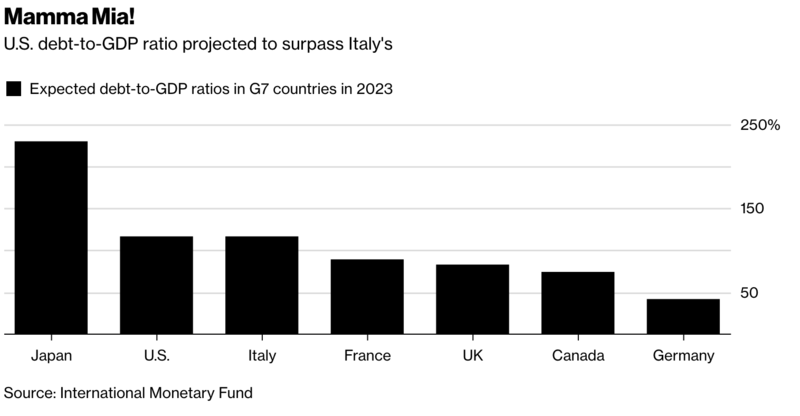 In five years, the U.S. government is forecast to have a bleaker debt profile than Italy, the perennial poor man of the Group of Seven industrial nations. The U.S. debt-to-GDP ratio is projected widen to 116.9 percent by 2023 while Italy’s is seen narrowing to 116.6 percent, according to the latest data from the International Monetary Fund. The U.S. will also place ahead of both Mozambique and Burundi in terms of the weight of its fiscal burden. The numbers put renewed focus on the U.S. deteriorating budget after the enactment in December of $1.5 trillion in tax cuts, and the passage more recently of $300 billion in new spending. President Donald Trump’s administration argues that the tax overhaul combined with deregulation will help the economy accelerate, which in turn will generate enough extra revenue to avoid any fiscal fallout. Officials with the Federal Reserve and Congressional Budget Office are skeptical about those expectations, as they forecast long-term economic growth will fall short of expansion rates needed to fund tax cuts. The central bank’s most recent forecasts show a median estimate of 2.7 percent for this year’s expansion slowing to 2 percent in 2020, while the CBO sees GDP growth slowing from 3.3 percent this year to 1.8 percent in 2020. Looking back across the past 50 years, we can clearly see that the 2008 Great Financial Crisis was a turning point. That was the moment where our addiction to exponentially increasing our debts began to have real consequences. What can ride to the rescue at this point? Not much. Our ‘recovery’ since 2008 is now one of the longest on record; another recession will occur sooner or later (Fannie Mae head economist Doug Duncan thinks one will likely arrive by next year). And with the arrival of recession, what will our leadership do? The only thing it knows how: print, borrow and deficit spend in attempt to boost ‘growth’. 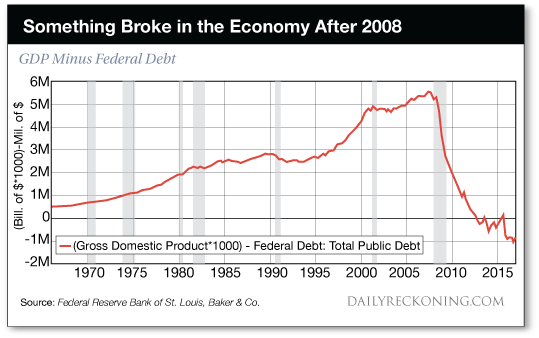 Except the debt will be even more expensive this time, and it’s ability to generate incremental growth per unit of new debt even weaker. In Part 2: Energy Is The Non-Negotiable Element Defining Our Future, we re-publish this report in full, which is even more relevant and important to heed today then when Chris wrote it eight years ago — as our economy specifically, and humanity in general, are totally unprepared for a future of even slightly less energy. Everything is tuned to grow exponentially. There is no “plan B”.